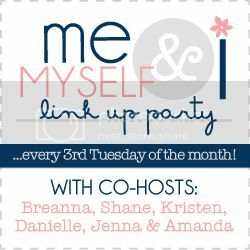 I missed the last round of the Me, Myself and I link up party. Generally a trip to Barnes and Noble and/or Target will do the trick. A new book or a new...petty much anything from Target is an instant pick me up! It would probably have to have been my costume last year. A group of my friends and I bought T-shirts that said, "Perkis Power." Now if you recognize that then yay you. If not then we can't be friends. Just kididng. But seriously, google it. Best Movie EVER! And totally quotable. 4) Five weird things about you we wouldn't know without being told? - I hate, loathe, and despise crickets. - I brush my teeth in the shower. - I can drink coffee any time of day. Caffeine doesn't keep me awake or anything. - Most of the time I have to have total darkness when I fall asleep. Except when I'm laying on the couch. You're life may not turn out how you think it will. Can't wait to read some of the other answers!